Newsprint Paper 9" x 12", 30lb. Standard, 30-lb. newsprint used primarily for pencil drawings and practice drawings. 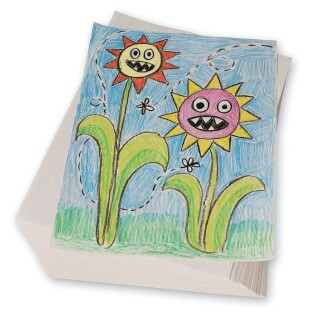 Can also be used with crayon, pastels, charcoal and for block printing. 500-sheet ream. Newsprint paper is great to use on our art easels. Inexpensive alternative for drawing and painting. Much happier now that white is available instead of the natural color. It can be used for more purposes and has a better quality. A lot of newsprint tears very easily but this is great! It's a great paper for everyday drawing and doodling. I am a parent educator and love to have this paper in a drawer so when my kids needs to doodle figure practice or whatever I am not stressed that my pennies are going in the trash because they are using the good art or printer paper. I was glad to find a bulk quantity too. It's a good quality weight. Excellent price but really not sturdy quality. I bought this for an events where children would color with washable crayons. The crayons tore through the paper which could have been children being rough handlers but the paper tore and I would not buy this product again. Merchant response: Thank you for your review. We sent your comments to customer service. This customer has been given a refund on this item. Economy Manila Drawing Paper 9" x 12", 40-lb.